As with many hard-but-worthwhile endeavors in life, some of these trials cannot be circumvented; they can only be survived. There’s no way around them, only through them. But I do think that with a little focus, you can ease the stress of your first year as a freelancer. I’ve assembled a list of ten must-do items here, and feel free to add your own in the comments. If you find this post helpful, you might also be interested in the upcoming session of my online course Getting Started as a Freelance Translator. Accept the realities of an ever-changing market. I put this first, because I think it’s a mindset shift that you need to make from day one. As compared to when I started freelancing in 2002, it’s harder to make a living at the low end of the market, and there’s more competition at the high end. Low rates at the low end have pushed, and I believe will continue to push, more translators toward boutique agencies, direct clients, and types of work that are unlikely to be encroached upon by machine translation. There are more people “gigging” in translation alongside other gigs. If you’re going to work in this profession, you are unlikely to defeat those forces on your own, so you’re better off accepting them. If you plan to work with agencies (ever, at all) subscribe to a translation agency rating service. Whether you have a membership to Payment Practices, the ProZ Blue Board (not affiliate deals) or something else, you need a way to vet potential agency clients. I find it both heartbreaking and frustrating when a beginning translator contacts me to let me know they have not been paid by an agency client, and in less than one minute, I’m able to determine that this agency has a track record of non-payment. Never, never, ever work for an agency without checking their payment ratings. Assess whether you can/should work for direct clients. Some beginners do work successfully with direct clients, but this requires that you are absolutely sure that your translation skills are solid, so that you aren’t stressed about the actual translation, leaving the mental space to stress out about everything else that a translation project involves. For example if you’ve already worked as an in-house translator for years, you might be very successful going directly to the direct client market. Some translators who work in niche specializations (Buddhism, Nordic skiing, musical instrument-making) may be forced into the direct client market due to lack of agency work in their specializations. It’s possible to succeed, but make sure you know what you’re getting into. Whenever you don’t have paying work, you’re marketing. I did lots of things wrong during my first year as a freelancer, but here’s one thing I got right: I chose the number of hours per week that I wanted to work, and when I didn’t have enough paying work to fill all of those hours–a common occurrence during my first year–I marketed. So, literally, if I planned to work 15 hours in a week and I only had three hours of paying work, I marketed for 12 hours. This might seem a bit obsessive, but I think that many freelancers check the inbox, see that there is no work, and then take the rest of the day off. Don’t do that. Market your specializations to the right kind of client. Don’t expect agencies to need a translator specializing in Middle Eastern history, and don’t expect direct clients to want a translator who takes anything and everything. Realize that agencies, although they may not want “anything and everything” translators, want translators who specialize in big business areas such as legal, financial, medical, IT, patents, etc. And realize that most direct clients prefer a translator who specializes in their industry or sector. Take advice from translators who know what they’re talking about. This is a tricky one, because as a beginner, you don’t know what you don’t know. However, you should seek out advice from experienced, professional translators, not any random person with an opinion about your career path. Case in point: when I was in college, I gave up on the idea of a translation career entirely, because a French professor told me that you needed to know more than one foreign language, which I didn’t. That’s totally incorrect–perhaps she was talking about a very narrow slice of our profession, such as UN interpreters? Who knows. But at any rate, I took it as gospel. Later on, other people told me that all translation work would be taken over by computers really soon (this was in about 2001), that all translation work was outsourced to low-wage countries, and that there was no market for into-English translators in the US. Also false. But how was I to know? The best defense here is to join something like a local translators association where you can rub shoulders with people who know what they’re talking about from first-hand experience in our profession. It takes a village. Freelancing is a solitary profession, but you need a posse around you; partially because freelance success is contagious. If you hang out with people who are earning minimum wage by finding jobs through online portals, that starts to seem normal. If you hang out with translators who have similar levels of financial security to people with traditional jobs, that too starts to seem normal. One of my best moves as a newbie freelancer was volunteering to edit the newsletter of the Colorado Translators Association. I didn’t have a purpose in mind when I did this: I just thought it would be a good way to learn more about the industry and get to know people. It turned out to be one of the best networking decisions I ever made, with about 50% of my first-year clients coming as referrals from people in CTA. Finding a formal or informal mentor is another great option, as is forming a group of newly-minted freelancers who can support each other and solicit advice from more experienced people. Pro tip: Experienced translators generally love to be asked for their advice and war stories. Take advantage of this and soak it up! Know how much you need to earn. This sounds basic, but many, or perhaps most translators could not tell you how many billable hours per week they need in order to reach their target income, or how many words per week that breaks down to. Read more in this blog post about budgeting for your freelance business. Be intentional about your business decisions. It’s unlikely that you’ll be generating a full-time income right out of the gate; it took me about 18 months before I was earning a full-time income. What matters is how you set yourself up for that: building up a savings buffer, then dipping into it to make up for what you’re not earning (which is what I did); working a part-time job that covers your basic expenses; or making a conscious decision to work for huge agencies that will give you as much work as you can take. The key is to be intentional about it, rather than getting swept away in a wave of panic when your bills are due each month, or opting for very expensive stopgap measures such as running up high-interest credit cards. Work like you’ve never worked before. Many of us get so obsessed with working smarter that we forget to work harder. It’s true that you don’t want to waste effort or be inefficient. But it’s also true that when you are in an uncertain situation, out-working everyone else isn’t a bad strategy. When I was a new freelancer, I did tons of things I would never do now: drove an hour each way to have a 20-minute informational interview with a potential client; did unpaid tests for any agency that seemed remotely likely to hire me; attended an ATA conference I could barely afford to attend, stayed at a hostel and brought my own food. In the end, those things resulted in many benefits, and I would encourage others to try them as well. Readers, over to you; what thoughts do you have about must-do items for our beginner colleagues? Beginners, what other questions do you have? Hi Corinne. A lot of great advice as usual 🙂 When you say “Whenever you don’t have paying work, you’re marketing” I would just stress that you need to make sure that your work is coming from a variety of sources. You can get lucky from the start and get one client who gives you a nice comfortable amount of work each week/month and you think “hey, this is enough” (especially if you can only work part-time, say because you are a new parent. But that one client can so easily decide to get an in-house translator or stop sending the work for whatever Reason. So to secure enough work also means “enough clients” too. Take care! Thanks, Julia! Such a great point: diversifying your client base is really important! I lost a great direct client literally overnight, because they (French university) hired someone to work in their international affairs office who was a native English speaker with translation experience. “Enough clients” is a great factor to consider! I joined Payment Practices at your recommendation, but found that it wasn’t actually useful to me as a way of vetting agencies. Back when I was working with translation agencies (I’ve mostly left the field at this point), I was working with Japanese agencies (which I found to be a good source of J>E translation work), but I found that Japanese agencies mostly weren’t rated on Payment Practices. So…just a word of caution that ratings might be robust for agencies specializing in some languages, but not all. Interesting, thanks a lot Ellen! This is a very basic one…But back up your work and TM files all the time, then make back-up copies of your back ups. Oh and don’t put your cup of coffee too close to your computer. YES!!! Oh my gosh, yes. Thank you!! Having had a computer pull a blue screen of death, *and* my online backups had not been running for about 24 hours (due to hardware faults that led to the blue screen of death…), I cannot second your advice strongly enough! Yes!! Especially if you have a cat that likes jumping on your desk :-0 And buy a spare universal laptop lead. Cos apparently they can just suddenly die on you and your laptop won’t charge! What a wonderfully thoughtful post. I learned most of these things in the first year or two of my venture into the lonely life of a translation professional. And I kept adding to that knowledge. The biggest one: that things keep changing… and you only realize them slowly. But you have to act quickly. Don’t want to take up this space with questions. Can I contact you directly? I’ve been remiss in marketing (strange for a former professional marketer) and networking. The networking gets pushed back when we are so incredibly busy. Anyway. Thank you for the valuable insights. It’s pretty easy to recognize bad agencies. They make you jump through hoops by signing forms and contracts, then they make you do a test, and they only offer very low rates. Not worth all the effort. Hi Mireille; for anti-trust reasons I’d rather not have a rates discussion here, but if you want to know what other translators charge, I’d recommend contacting them directly. If you e-mail me directly, I’ll tell you my rates, which are not pricing recommendations, but just information about what I charge. Thank you, Corinne, for that input giving me several inspirations how to get more work from existing clients. I want to specialize in direct clients in International Trade – an industry rather new to me. When I contact industry experts to “show me the ropes”, they always think I am looking for jobs. How to avoid that pitfall? Thanks, Andreas! 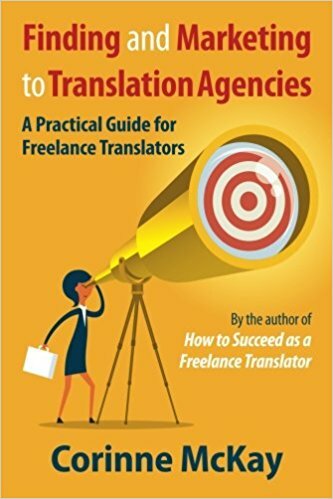 Try asking Amanda Williams for advice (https://www.mirrorimagetranslations.com/) she’s a French to English translator who worked for many years in international trade and now translates in that sector. Hello, Corinne! I just want to join my fellow translators and congratulate you for this amazing post! This is somewhat my version of “Chicken Soup for the Human Soul” in translation. I’m a beginning translator and your pieces of advice are quite a gift. One of my New Year resolutions was to learn about marketing for freelance translators. I’ve also been listening to your podcasts, which have helped me tremendously to focus on what I don’t know that I need to learn. As you say freelancing is kind of lonely, so the fact that you share your experience with us gives me hope and makes me feel that I can succeed. I live in Venezuela, so your blog and podcasts are like a window to the first world of translation. They really foster learning about the industry and business skills. Thank you Corinne, I can definitely relate to this, as I am frantically switching between working on my CV, my website, volunteering etc… I have just qualified and in a very weird and scary place at the moment. Your post gave me some hope! Thanks for your comment; I’m glad it gave you hope!! I agree that the first year of freelancing is weird and scary; good for you for powering through it and let me know if there’s anything else I can do to help! Really helpful thoughts here, not just for year one. Thanks. Great, glad you found it helpful even as an experienced person! Thank you so much, Corinne. You are an inspiration to us all! Hello Corrine, I just discovered Thoughts on Translation and I value your article. 2019 is my first year at launching my freelance career in translation. There is a lot to do and your article has motivated me to keep moving onward!